2) Cut chicken into cubes. Place in olive oil. 3) Combine Panko and dry spices in bag. 4) Place 5 chicken pieces at a time into spice Panko bag and shake. 5) Place Panko crusted chicken onto aluminum foil covered oven rack and bake at 350F for 10 min, then flip chicken bites over and bake for another 5 minutes. 6) Remove from foil and serve. 1) In a bowl, stir all ingredients together. Add water for desired thickness. Refrigerate and enjoy! In a large bowl, combine panko breadcrumbs, dry dressing mix, cheese, garlic powder, salt and pepper. In another bowl, toss chicken strips with egg to coat, shaking off excess. Toss chicken strips with breadcrumb mixture, pressing crumbs into meat to adhere. 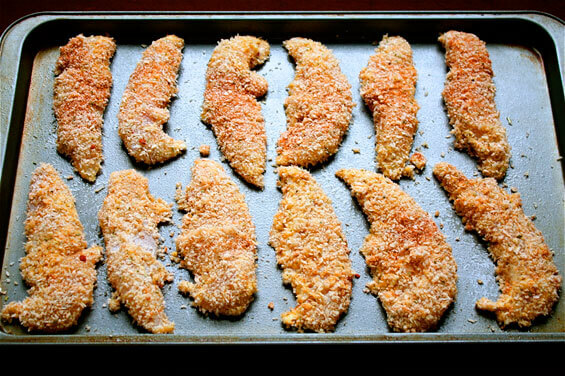 Place breaded chicken on a baking sheet coated with nonstick cooking spray. Bake at 350 for 10-15 minutes or until chicken is cooked through. Preheat oven to 350F. Prepare a baking sheet by covering it with foil and lightly spraying with cooking spray. Set aside. In a small bowl or shallow dish, season the flour with salt and black pepper, and lightly beat the eggs in another shallow dish. In a third shallow dish, combine panko breadcrumbs with oregano, garlic, paprika, cayenne, salt, and pepper. If using chicken breasts, prepare by putting one breast in between two layers of plastic wrap. Pound to an even thickness of approximately 1/2″. Remove plastic and slice into strips. Dredge tenders in the flour to coat, shaking off any excess flour. Dip the floured chicken tenders into the egg and then coat the chicken tenders with the breadcrumb mixture. Arrange on baking sheet. Repeat with remaining strips. Bake chicken tenders for 12-15 minutes, or until golden brown, flipping once part way through the cook time. To prepare sauce, whisk together honey and barbeque sauce in a small bowl until combined. Season to taste with salt and pepper.